If there were an award for ‘Most Superfluous Slot Release Ever’, Book of Lords would win it hands down. You see, Book of Lords by Amatic is simply an exact clone of Book of Ra, in a world where there are already hundreds of these clones. And to make it even more unnecessary still, Amatic itself has already released several Book of Ra clones, the very popular Book of Aztec among them. Granted, Book of Lords looks excellent with beautiful symbols, smooth spinning reels and good looking backgrounds, replete with fiery braziers. But the rest of the game is identical to Book of Ra/ Book of Dead, including the paylines, the theme, the payout table and all game mechanisms. How does the Book of Lords slot work? Book of Lords has 5 reels with 3 rows of symbols. There are 10 variable paylines and betting starts at $€ 0.10 up to a maximum of $€ 5, per spin. 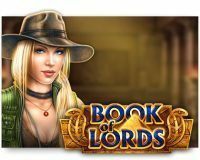 The biggest payout is 5,000 x the total bet, and that makes Book of Lords a video slot with a high variance. Amatic never reveals the payout rate of their online slots. So as far as the RTP is concerned, we have to keep it to an estimate based on what we’ve heard on the market. Amatic slots, on average, pay out an average of 96% of all wagers back to the players. The highest value symbol is the female explorer/adventurer. She will pay out 5,000 coins with 5-of-a-kind on an active payline. If you are playing with all paylines active and during the free spin bonus you land a full screen of these tough ladies? Then you win you 50,000 coins, what amounts to 5,000 x the total bet. The premium symbols consist of different Egyptian mythological beings. These pay out between 750 and 2,000 coins when you spin 5 identical ones. The card symbols 10, J, Q, K and A are worth between 100 and 150 coins; again you need 5 of the same. The Book of Lords symbol doubles as wild and scatter symbol. Amatic or more scatters get you ten free spins. Before you start the free spins, a special symbol is selected. This can be any symbol from the primary game, except the wild/scatter symbol. This special symbol expands over the entire reel, and all paylines become active, no matter where the symbols are on the reels. 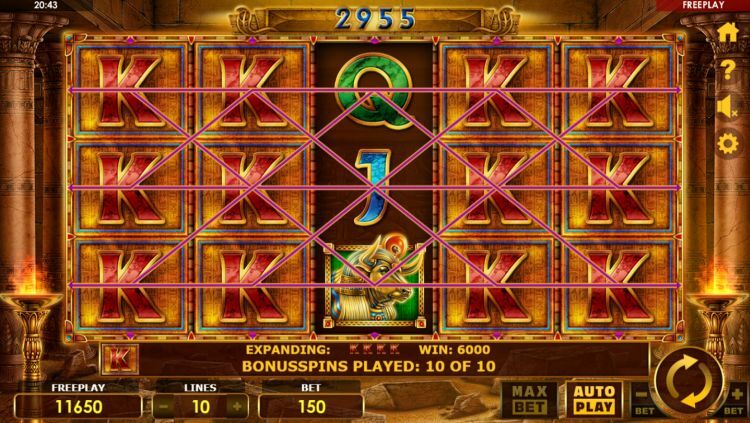 It is possible to retrigger the free spins limitlessly. 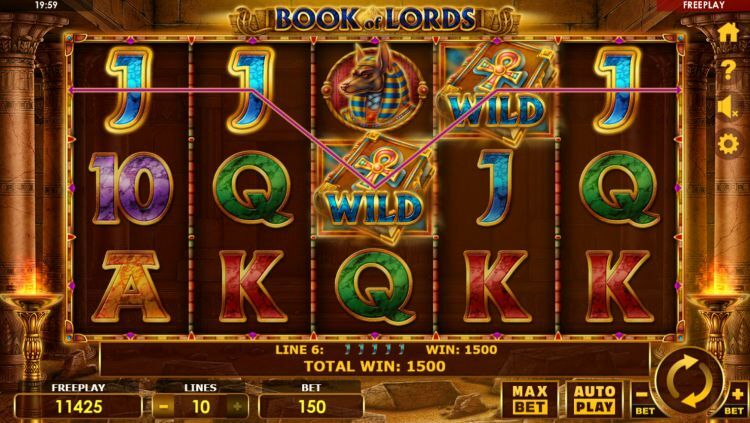 Our verdict on the Book of Lords video slot? As we pointed out at the beginning of this review, we feel there was no need to release this Book of Lords slot. It looks cool (especially for an Amatic release), but never shows anything that has not been done before, countless times. Are you a true Book of Ra freak and you want to play something that looks a lot like it? 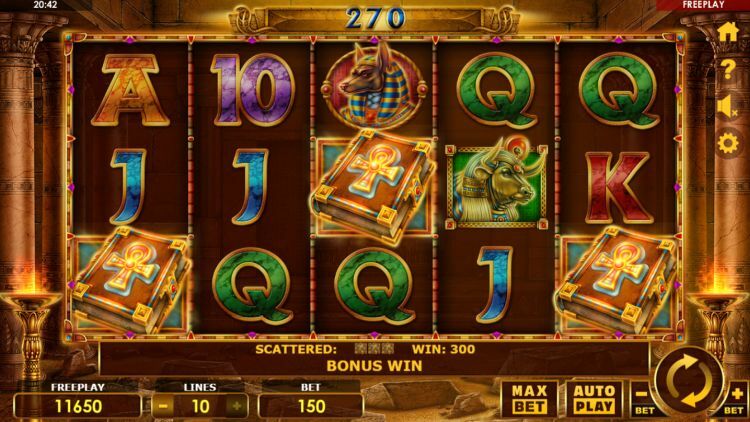 Then the Book of Lords slot is a great alternative. You won’t find it here in Book of Lords. Where can you find the Book of Lords slot? 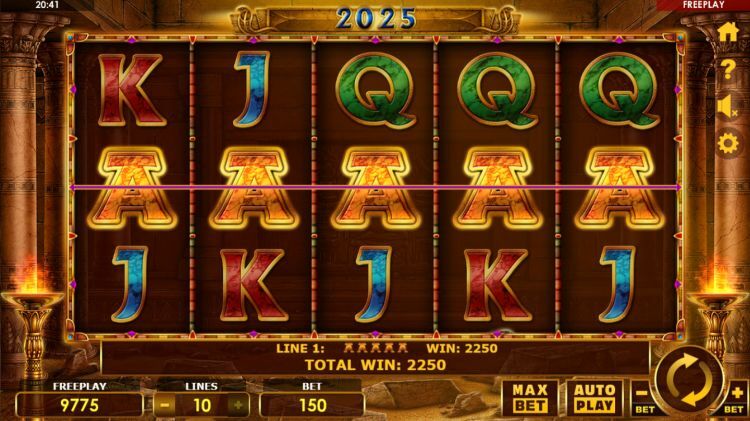 The Book of Lords slot is found at all reliable Amatic casinos. One of these Amatic casinos is Slots Million, which is one of our favourite online casinos. You can play the Fruits slot at Slots Million with a 100% bonus up to $€ 100 plus 100 free spins.